The Winnipesaukee Public Health Council (WPHC) has identified access to health care as a regional health priority. The goal is to increase numbers of individuals enrolled in health insurance through the NH Health Protection Program (Medicaid Expansion) and the Health Insurance Marketplace and to improve health literacy with a focus on low income individuals/families. Access to health insurance improves health outcomes. Over the past year, Certified Marketplace Assisters, Navigators, Application Counselors and vested personnel from ServiceLink, HealthFirst and LRGHealthcare have been collaborating on this effort. Many individuals have never had health insurance. 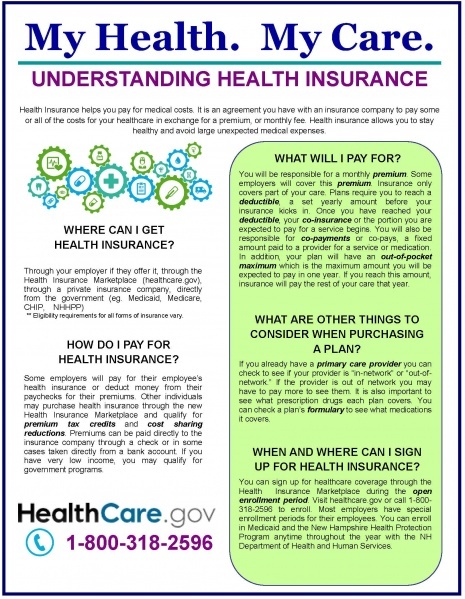 Understanding health insurance, how to navigate health care services and how to stay healthy is complicated and at times challenging. Our regional Access Workgroup has reviewed available health literacy toolkits and has chosen Nashua Health Department's "My Health, My Care" to base our health literacy efforts. The goal is to increase access to health care through education and awareness of affordable health care services. We have received approval from Nashua Health Department to use their materials. AARP "My Personal Medication Record"
This project has been funded in whole or in part with federal funds from the National Library of Medicine, National Institutes of Health, under Contract No. HHSN276201100010C with the University of Massachusetts, Worcester.